Every national title recorded a drop in its average circulation, though some fared better than others. EVERY NATIONAL newspaper saw its circulation decline in the second half of 2012, when compared to the second half of 2011, new figures have shown. Data published by the UK-based Audit Bureau of Circulations, commissioned by the Irish titles, showed that every national title saw its circulation fall over the year – with some titles faring better than others. The Irish Times had a daily circulation of 88,356, down by 8.1 per cent from the equivalent period in 2011, while the Irish Independent‘s circulation dropped by 5.5 per cent to 123,981. Both of the major Thomas Crosbie Media titles, the Irish Examiner and the Sunday Business Post, saw their circulation drop under the 40,000 mark – the Examiner down by 6 per cent to 39,555, and the Business Post to 39,416 (down 8.6 per cent). The Cork-based Evening Echo saw circulation fall 11.1 per cent, to 16,560. The Irish Daily Star lost 11.1 per cent of its circulation, falling to 66,491. INM’s Evening Herald dropped 5.8 per cent to 58,826. The figures for the Irish editions of British-owned tabloid papers are measured on a monthly basis, as part of the more regular auditing of their British parent titles, but have shown falls of similar scale. The Irish Sun‘s circulation for January 2013 fell 8.8 per cent year-on-year to 66,823; the Irish Daily Mirror was down 8.27 per cent to 56,872, while the Irish Daily Mail held steady, dropping only 0.24 per cent of its circulation to 50,207. It is the Sunday market which has shown the most flux, particularly in the tabloid end, where the vacuum from the closure of the News of the World in July 2011 has led to more dramatic changes of fortune. The Sunday Independent remains Ireland’s most widely-read newspaper, despite a drop of 5.4 per cent in its circulation to 237,185. The Sunday World - which had recorded the highest circulation of any title in the equivalent period last year – saw a fall of 13.6 per cent, to 217,141 copies circulated each week. The Sunday Times fell below the 100,000 barrier, down 6.6 per cent to 98,132 copies. The Irish Sun on Sunday, which was introduced to the market in February 2012, had an average weekly circulation of 58,749 – only just over half of the old News of the World’s final weekly circulation, of 113,111, but enough to damage the Irish Sunday Mirror – which saw circulation fall 31.7 per cent to 41,910. The Irish Mail on Sunday also saw its circulation fall as a result of the new tabloid entrant: it had a weekly average of 98,484, down by 14.5 per cent. Circulation does not necessarily equate to average sales at news-stands and newsagents; it also includes subscription copies and complimentary copies provided in places like hotels. The figures are separate to readership statistics produced by the industry-run Joint National Readership Survey, published earlier this month, which showed that roughly 82 per cent of the adult population read a newspaper on a monthly or weekly basis. 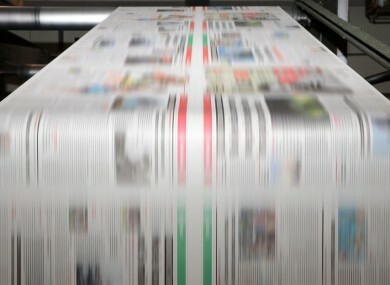 In that instance, National Newspapers of Ireland chairman Frank Cullen told AdWorld.ie that the slight fall in readership figures was probably as a result of the drop in employment numbers – meaning fewer people attended a workplace where newspapers could be shared around. Correction: This article previously carried an error relating to the 2011 circulation for the Sunday Independent, suggesting its circulation had risen in 2012 compared to 2011. The 2011 figure has been corrected and the 2012 performance revised accordingly. Email “Newspapers record falls in circulation in second half of 2012”. Feedback on “Newspapers record falls in circulation in second half of 2012”.